Not digging the gold frame? The addon can add the information to mob tooltips instead. It'll also adjust to whatever role you're playing. Are you the upcoming greatest tank in the universe? You'll see useful tank tips. Do you prefer to keep the greatest tank in the universe alive by healing instead? Healing tips. Pictured tooltip sample only. Doing great not guaranteed. QEM+DT (too early for an acronym?) changes your dungeon experience by giving you full information on each mob as you progress, removing a lot of the anxiety and nerves that can come with clearing a dungeon for the first time. Consider this your mini-guide to dungeon and Mythic+ content. 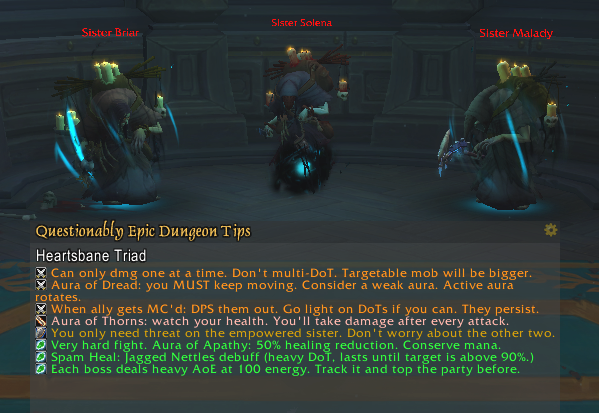 Tips added for all Battle for Azeroth dungeons! Stay up to date on new changes by following Questionably Epic on Twitter. Awesome but unfortunately takes up too much screen real estate. :( Wish we could resize. Thank you for the addon. Just wanted to say that this is an awesome addon! For those of us who don't run every bit of content every week, you can go awhile between doing a specific dungeon, and it's really nice to have a quick refresher up on screen. So thank you for making this! Would be nice to be able to resize the box. Thanks for putting this out here. I made weak auras with descriptions of abilities for legion dungeons and this is much nicer. Option to hide while in combat or hide during raid would make this addon better. Please add option or have to leave disabled.. I've added a minimize button to alleviate this a little while I work on version 5. There's a proper raid toggle in version 4.8. It's now live. Yea, please give us an option to toggle the display or to disable in raid. I've added a raid toggle to the options menu. You can now decide where you want it on, and off. Sorry for not having this included when the raid tips were added. Is there a way to make it so that you can toggle the window so it can be moved without being in a dungeon? also, the ability to resize the window would be fantastic. Overall, and invaluable tool for those learning the dungeons. Excellent addon! How do i make the window smaller, its huge. After playing with the addon I can say this is really really useful. Eventually we won't need it anymore but the concise things about what to worry about is great. I would just really ask to consider a button so we can print the text to party chat. Some people don't have the addon, some people don't want to say they don't know the fight, some people -think- they know what to do but really don't. When pugging we can skip a lot of trial and error simply by pressing the button at a boss. This has got to be the best suggestion I've seen. I second this 100%. How do I open this add on in game to look at configuration, etc? Hit escape -> Interface -> Addons -> QE Dungeon Tips. You can also zone in to a Legion or BFA dungeon which will pop the frame up for you. This seems really useful. I'm reminded of something that did the same back in the first weeks of Cataclysm heroics. Consider having an option to print the info to the chat so we can do fewer 'is everyone sure of what they are supposed to do?' and more simply hitting the button and the chat has all the into for people to read. Thank you for a great add-on! i was wondering if there is a way now (maybe i didn't see it) or in the future where we can change the size of the font in to add-on window? its a pain for me as i play on a large T.V and makes seeing the text hard. but other than that, love your work. Coming very soon. Should be about ~2 weeks away. Font options are definitely a necessary upgrade.